Adagio pairs skating is the newest discipline in figure skating. It is much like the pairs discipline, but offers more unique lifts and acrobatics. This show, only held once in 1998, was a unique improvisational skating exhibition of top-class skaters creating their program only minutes before performing. Only the pairs were scored in the event. 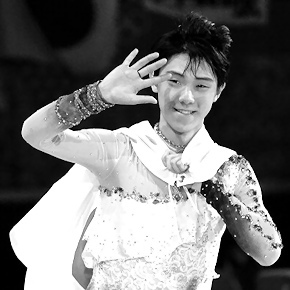 Yuzuru Hanyu became the first Japanese single men’s figure skater to win an Olympic gold medal at the 2014 Olympics. He defended his title at the 2018 Olympics. the first skater in history to successfully land a quadruple loop in competition (2016 Autumn Classic in Canada). is the first skater to successfully land a quadruple toe-triple Axel sequence in competition (2018 GP Helsinki). is the first skater to successfully land three quadruple jumps in the second half of a free skating program (2017 World Team Trophy). broke 12 world records prior to the implementation of the +5 / -5 GOE (Grade of Execution) system, which was established beginning with the 2018-19 season. More on Yuzuru Hanyu in the GS Forum.